Lisa Andrews, outreach and education specialist at Big Cypress National Preserve, gets ready to lead a wetwalk tour into an alligator hole. Ranger Lisa Andrews leads into a cypress strand, an area where elevation drops and more nutrients are collected in the soil to support cypress trees and other forms of plant life. The alligator hole is in the center of a cypress dome, and it’s where an alligator will nest during the winter season, usually around January through March, when the water levels go down, and the shallow areas of the marshland dry up. In there, the alligators use their snouts to push mud aside to look for food; this in turn deepens the hole, and allows the cypress trees to grow taller. It is a cycle that has gone on for centuries, long before Juan Ponce De Leon and his band of misfits landed in a land so lush they called La Florida, in 1513. The water acts like a life source to the preserve. It holds and spreads an abundance of minerals found in the soil throughout the land and allows vegetation like bromeliads, Spanish moss, and ferns to grow. This natural water flow in the Big Cypress National Preserve, which stretches across 720,000 acres in West Miami, remains also crucial for water conservation and the survival of different species living in the Everglades and estuaries in the Ten Thousand Islands regions. While the neighboring Everglades National Park receives it’s fresh water from Lake Okeechobee, Andrews says the Big Cypress National Preserve collects its water from the rain. Rainwater flows slowly through the preserve’s prairies and marshes, and steadily makes its way southwest. “The water helps keep marine species that are commercially valuable alive, species that we like to eat like grouper and snapper. All these things spend at least a portion of their life cycle in those estuaries,” Andrews said. Freshwater allows for many plant and animal species to live together in the Big Cypress National Preserve. Andrews calls the national preserve a mosaic of habitats. “It's like a big patch work quilt of ecosystems,” Andrews said. 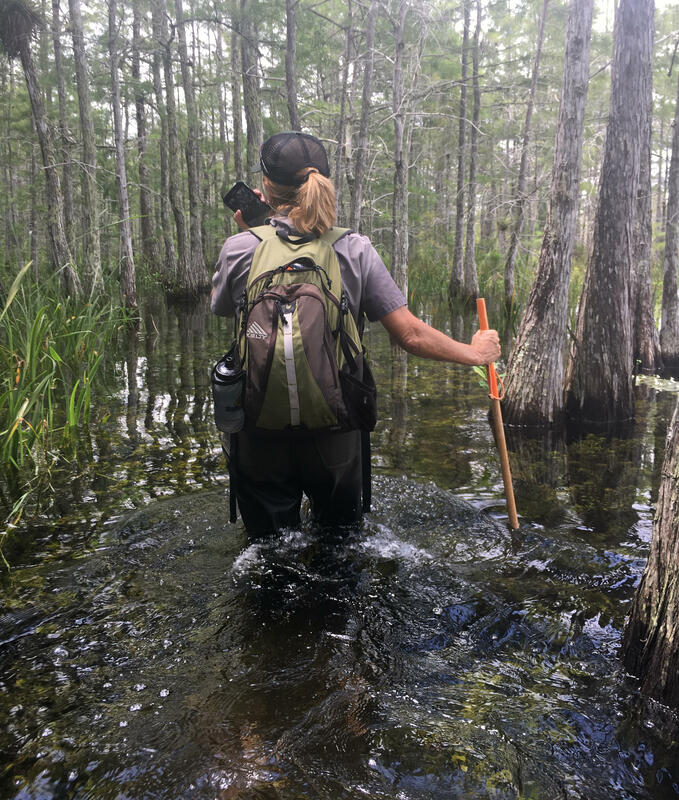 She points to the shifts in elevation in the preserve, that create ecosystems like prairies or “hardwood hammocks,” which are slightly elevated areas where threatened species like the Florida panther and black bear live. “Just a few inches makes all the difference in the world,” Andrews said. But all of the natural ecosystems were at risk in the early 1970’s, when plans for a large-scale airport threatened the area north of the Everglades. “They went as close as to putting a runway, which is now used as a training facility,” Andrews said. The area showed signs of development as early as the 40’s, when a few amount of settlers built and bought land there to harvest produce like tomatoes. A sheet of water covers lower regions in Big Cypress National Preserve. The water slowly travels southwest to the Everglades and into estuaries in the Ten Thousand Islands region and the Gulf of Mexico. In September of 1943, the Humble Oil Company -later known as Exxon- discovered oil in the area, and in turn, the Big Cypress Nature Preserve became the home of Florida’s first producing oil well. 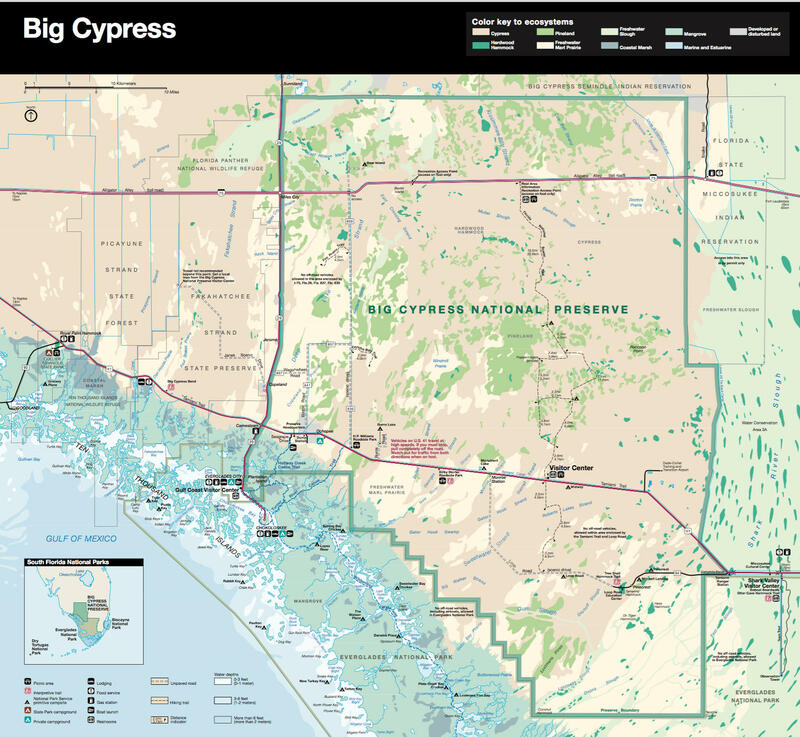 Plans of including Big Cypress into the area of the Everglades National Park -established in 1947- failed in face of the daunting task to track and identify the series of owners that claimed rights to the area. Thus it was left unprotected, even though its equilibrium is vital for the very same "River of Grass" that environmentalist and civic leaders wanted to protect with the proclamation of the national park. So when plans for the airport loomed over the natural resources in the land, settlers, along with environmentalists, hunters and politicians worked together to prevent any more jeopardizing developmental projects. 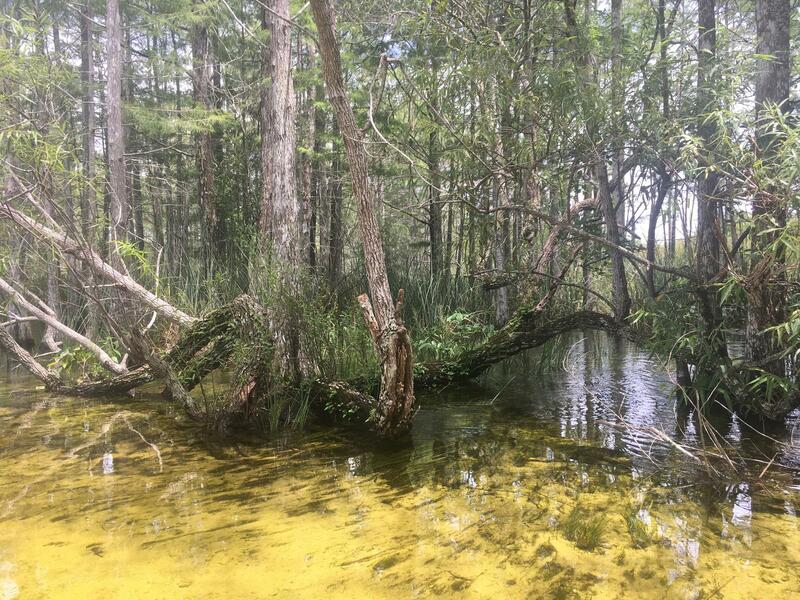 “It [Big Cypress National Preserve] was saved by a handful of people who recreated there, they hunted and fished there, and just loved the land,” Andrews said. The Big Cypress National Preserve, the first of its kind in the United States, was thus established in 1974. Today, outreach programs in the preserve will take visitors and interest groups on wet and dryland walks into these different ecosystems, like the alligator holes. The preserve may not classify as a national park, but it offers a spectrum of similar activities like: camping, canoeing, biking, nature trails or tour-rides on swamp buggies that truck through shallow waters and muddy terrains. 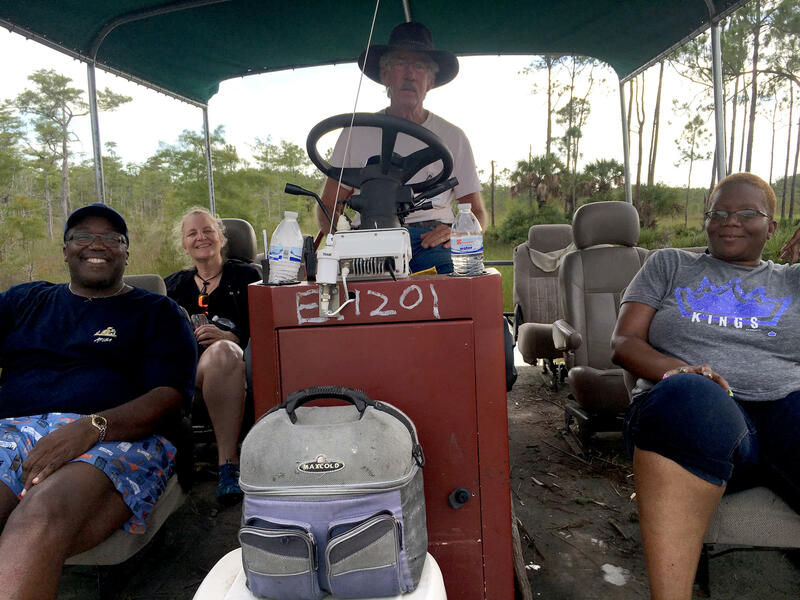 From left to right: Bobby Baker, Barbara Marsh-Wetherellll, Otis McMullen (tour-guide) and Aubrette Baker, take a ride on a swamp buggy as they tour and learn about the different environment and species in the Big Cypress National Preserve. It’s where national and state officials work together and where oil and gas exploration and extraction that started back in the 1940s continues, under the guidance of environmentalists looking to conserve the preserve’s ecosystem. Small amounts of hunting is allowed under the preserves’ unique rules and regulations, which also protects the customs of the Miccosukee Seminole tribes that live in the area. Andrews said the park rangers focus on different restoration projects, which aim to reverse some of the damaging effects of earlier development. Conservationists have installed culvert pipes, which allows water to flow under roadways into natural rivers along Turner River Road. They have also installed plugs, which forces water back into original rivers that might have dried up.